If you're tired of having to add hot or cold water to your bath to find the perfect temperature, you'll love this thermostat: thanks to the GROHE TurboStat® technology, this modern bath mixer with shower outlet will fill your tub reliably at the desired water temperature. The AquaDimmer volume handle features an integrated diverter, allowing you to switch smoothly between tub and shower using the same handle. For the safety of your family, the GROHE CoolTouch® technology keeps the surface of the thermostat cool, and our SafeStop scalding protection prevents users from accidentally turning up the temperature. To conserve the environment, the integrated EcoButton allows you to save water. 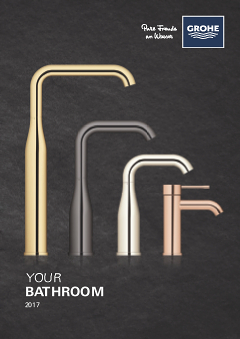 With ergonomic metal handles and our GROHE StarLight® chrome finish for a stunning durable luster. Go green in the bathroom when you cut your water use in half. GROHE EcoButton technology offers you a full flow when you need it at the push of a button – to fill the tub in a hurry, for example. But standard operation reduces water consumption by up to 50% – saving on bills and reducing your carbon footprint without compromising on comfort.